St Barnabas Lincolnshire Hospice has announced the Colour Dash will be returning to the Lincolnshire Showground on Saturday 13th May 2017. This year, 3,500 people were showered in environmentally friendly powder paint and together raised more than £120,000 for local hospice care. Becky Otter, Event Manager for St Barnabas Lincolnshire Hospice, said: “We are delighted to announce after the huge success of this year’s Colour Dash, the fun-filled event is back. “The Colour Dash is proving to be our most popular event and has sold out in the two previous years. “Colour Dash is all about wearing your biggest smile, raising money and having fun with your friends and family. The Colour Dash is a 5k route lined with paint stations, which will see runners splattered in paint at every kilometre. To take part, participants must be aged five years old and over, and anyone aged 16 and under must be accompanied by a paying adult. 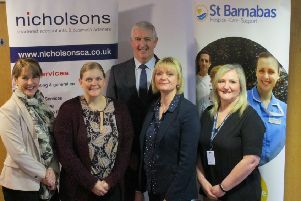 Becky said: “This year we are hoping to raise in excess of £200,000 to help St Barnabas care for more patients and their families, every day of the year. Registration is now open, where adults can take advantage of the early bird price of just £15 and £5 for children. Participants can also buy an early bird family ticket (two adults and two children) for £35. The early bird price is valid until 1st March 2017. The registration fee includes a fundraising pack, neon sunglasses, bottle of water, poncho and a commemorative medal. The headline sponsors for Colour Dash is Western Power Distribution and Running Imp.